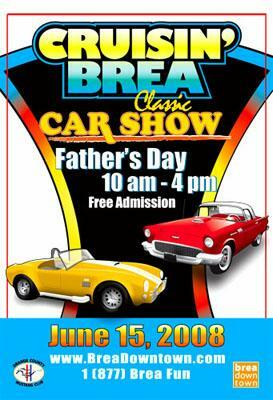 “Crusin Brea” is a Father’s Day favorite in Orange County, CA. It’s a good time for all. Hosted by the Orange County Mustang Club this fun event will showcase classic cars from every make and model you can imagine. Just think about it, for some of us it’s like a step-back-in-time just seeing your favorite “57 Chevy”. Dwane Roberts from Yorba Linda, CA is one of my all time favorites. Dwane’s 57 is well known as the “Best of Show” throughout the southland. I hope he will be there again in 2008. If you’re celebrating Father’s Day, remember this event could be one of Dad’s favorites. Location: Brea’s Downtown on Birch Street (Just West of Brea Blvd. and North of Imperial Hwy.) You know it’s where you will find all the theaters and the fun eateries and shops around town in our city. More good news… this fun family event is absolutely FREE ~ In addition parking is FREE! Great article and a great choice for a dad on his day.